This elbow pressure balanced expansion joint was designed for a chemical processing plant to aid the nitrogen oxide process for compound fertilizers. It is 18″ diameter with a face of weld-end to centerline of elbow length of 83- 3/8″. The body of the assembly, the pipe, covers and tie-rods were fabricated from 304L stainless steel, the bellows and liners from 321 stainless. This unit was designed for 1/2″ compression and 4-1/8″ lateral movement with an operating temperature of 600°F at 125 psig. The assembly was dye penetrant tested and hydro-tested at 190 psig prior to shipment. This webinar was created to explain the basic principles of expansion joints in the simplest way possible. The presentation will introduce you to expansion joints and concentrate on metallic and fabric expansion joints. It will explain the various designs, applications and details of each expansion joint using simple terms and a lot of visual aids. The presentation will conclude with general guidelines of the maintenance and ordering process. This 153″ x 55″ x 21″ fabric expansion joint was custom designed for an exhaust application in a gas turbine facility overseas. It is fabricated from carbon steel with a painted frame and liner. 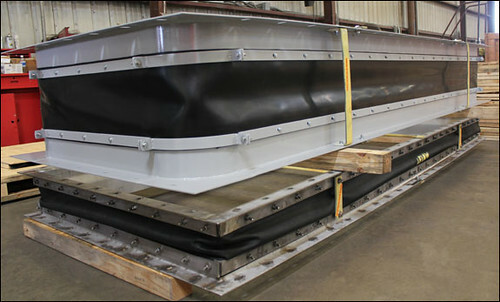 The fabric belt is reinforced neoprene, and it’s designed for +/- 100″ water column with a temperature of -20°F to 600°F. A dye penetrant examination and paint thickness test was conducted on the assembly before being shipped.